#610 regular meeting was held on December 19 at Nogeyama- free-frat. We enjoyed 2015 Year End Christmas costumed meeting with three 1st time guests and a 2nd time guest. Two of them were a married couple from Sri Lanka and study at a Japanese private university. 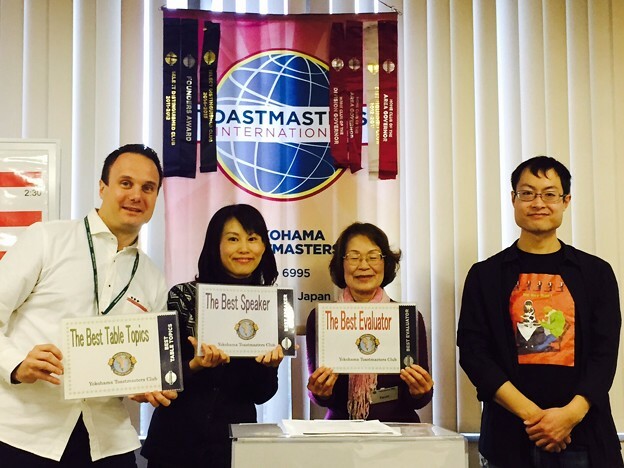 Husband used to join a Toastmasters Club in Sri Lanka till coming to Japan and delivered a skillful table topic speech and got the best table topic speaker pushing away others beautifully! Theme of the day was “What was the most memorable thing, happening or incident for you in 2015. All role takers shared theirs with participants, wedding party event, family trip, growth of child, bereavement and so on. The word of the day was “lovely” According to the word of the day master, “lovely” is not always a feminine word. You can use the word in expressing meaning great or excellence and so on. As it was easy and familiar word, many used it in their speech. Table topic theme was “about movie” Four speakers delivered impromptu speech. 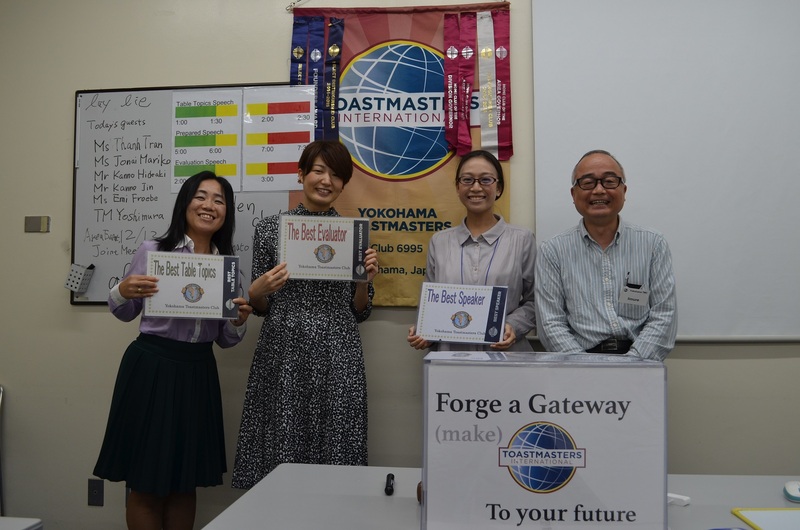 We had two prepared speakers and a workshop regarding to “Virtual Attendance”. An advanced speaker talked about her honorable TM’s story and other speaker delivered how to remember person’s name from her experience. Two evaluators made good evaluations in suitable ways. Grahco shared her method to reduce unnecessary word. “For example”, “in another saying” instead of “Ah,uh”. General evaluator evaluated the whole meeting in detail and gave us a lot of improvement. Thank you very much TM Y. She is excellent. High motivated all guests told that they would come to new year regular meeting on January 9th in their guests comments. So let’s welcome them with warm heart. Anyway, we finished the year end regular meeting successfully. We are looking forward to seeing you all in the new year! We wish you have a happy new year! YTMC regular meeting was held in order Dec. 5th. Timer and Vote Counter was new to each role taker. There were four educational speech, and good evaluations. One new trial, officers and VPM committee held an oriantation for new members, and I think, they could know the flow of regular Meeting. Our 608th Meeting had the theme of “My Favorite Book” and all role takers did well in sending the TMOD all their interesting books. The Word of the Day was a difficult one “Embolden” which was not used very well throughout the meeting. We have several 1st time guests as well. 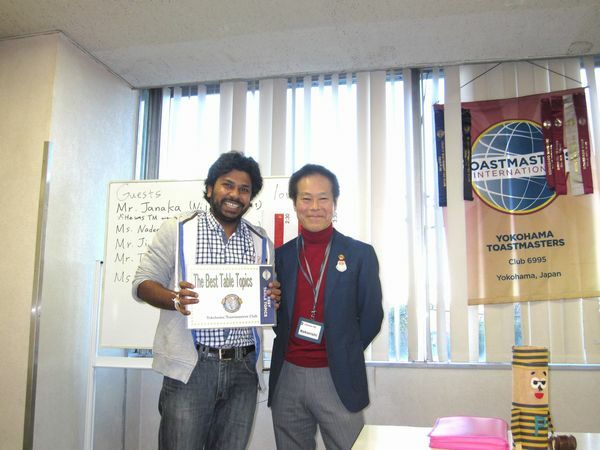 We had an induction ceremony for a new member from Vietnam TM Th. She also performed her CC #1 Icebreaker Speech at this meeting. The Table Topics is always interesting and funny when TM Ma. does it and he didn’t disappoint us again with some tough questions. In our Prepared Speech session, TM Ts. gave us insight into her actual job as an interpreter. TM Fu. explained to us how we can sell our skills online through the crowdsourcing initiative, which was very interesting and a new topic for many. The General Evaluator TM Fr. took over after the break and reviewed in great detail the meeting even evaluating the Table Topics speakers. We finished with 3 beautiful ladies cleaning up the awards as you can see below.